As the end of the Seventeenth Century approached, peace came to most of Europe. Privateers found themselves without jobs, as did many naval seamen. This “golden age” saw the greatest upswing in piracy ever. Unlike their predecessors, the buccaneers, these pirates preyed on merchant ships rather than Spanish galleons laden with gold and silver. Most prowled the Caribbean and Atlantic coast of North America, but some plied their trade off the West Coast of Africa and in the Indian Ocean. The height of plundering lasted about a decade from 1715-1725. Most pirates were English (35%), but other nationalities were also represented: colonials from America-25%, colonials from the West Indies-20%, Scots-10%, Welsh-8%, and Swedish/Dutch/French/Spanish-2%. A fair number of blacks also joined the pirates. When Bartholomew Roberts set sail, 48 blacks served amongst his crew of 228 men. By the time of their capture, that number had increased to 75. Although pirates flew flags before this time, the Jolly Roger we know belonged to the pirates of this age. They favored sloops and ketches to hunt their prey. While New Providence in the Bahamas provided them a safe haven for a time, Woodes Rogers changed that after his appointment as governor. He offered pardons to the pirates, then employed any who accepted to hunt other pirates. Those captured hanged. The pirates of the Golden Age had common traits. Their victims usually surrendered. The pirates boldly declared their identity rather than engaged in tactics such as the ruse de guerre. They attacked ships away from land and took their time gathering their spoils. The majority of plunder taken wasn’t gold and silver, but supplies to maintain their ships and whatever everyday items (such as food and drink) they needed. The most successful ventures occurred when two or more pirate ships confronted their prey. Perhaps the most famous pirate was a master at intimidation. Blackbeard carried three braces of pistols, placed smoking hempen cord in his beard, drank rum mixed with gunpowder, and looked at people with wild, staring eyes. Mentioning his name was enough to frighten any eighteenth-century mariner. 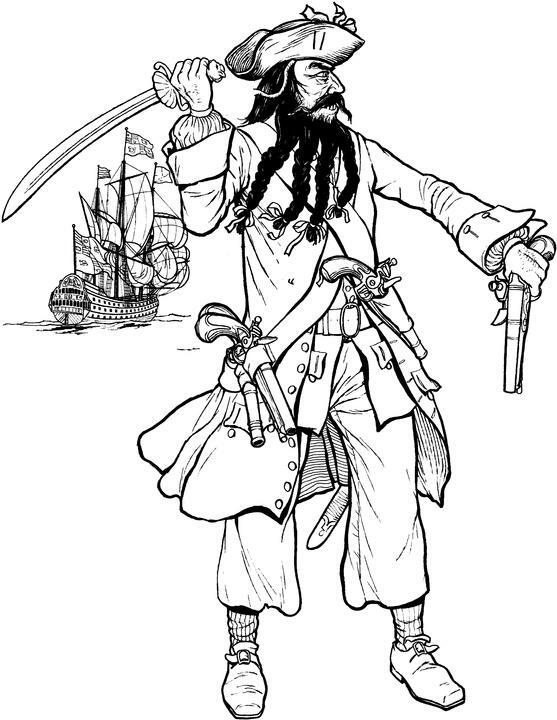 Like many Golden Age pirates, Blackbeard was a privateer before he turned pirate. When peace finally came to Europe, he embraced piracy and became a charismatic legend in his own time. Initially, he signed with Benjamin Hornigold, a pirate who nurtured Blackbeard and taught him a fierce reputation would stand him in better stead than engaging in torture to achieve his ends. They based their operations in Nassau and plied the coastal waters of the American colonies. On their way home, they captured a French vessel named Concorde. It was to be the last prey Hornigold took, for he decided to seek the king’s pardon. Eventually, this pardoned pirate became a pirate hunter. Blackbeard converted the Concorde into a pirate ship manned by three hundred men and carrying forty guns. He changed her name to the Queen Anne’s Revenge (QAR) and chose her for his flagship. Following Hornigold’s advice, he cultivated a bloodthirsty and wicked reputation. His successful attacks against ships of the British Royal Navy further enhanced that image. He did not engage in wanton murder and mayhem unless his victims resisted. During the first three months of 1718, Blackbeard disappeared. No records exist to tell where he went or what he did. When he resurfaced, he led his fleet of eight vessels to Charleston harbor, blockaded the port, and held some of the town’s leading citizens for ransom. Rather than demand jewels and money, he requested a chest of medicine worth £300. When four days passed and the governor of South Carolina still had not met his demands, Blackbeard aimed all his guns on the town and would have fired had the pirates who delivered the ransom note not returned with the medicine. Eventually, Blackbeard sailed to Ocracoke Island on the Outer Banks of North Carolina with the intent of seeking the king’s pardon. He knew, though, that too many pirates accompanied him, so he hatched a plan to rid himself of some. He purposely grounded the QAR and another ship, then sent some men ashore with orders to seek out a pardon for everyone. After they left, he and the remaining pirates sailed to Bath Towne, obtained pardons from the governor, and retired from piracy. Blackbeard married a young woman, moved into a house, and became a local celebrity. He engaged in a smuggling operation, which he based on Ocracoke Island. Restlessness soon afflicted him, and once more he returned to piracy. On his return to Ocracoke, a fellow pirate visited him and they partied ashore. Before long, other pirates joined the festivities and fearful colonists demanded someone stop Blackbeard and his friends before they established a pirate fortress. 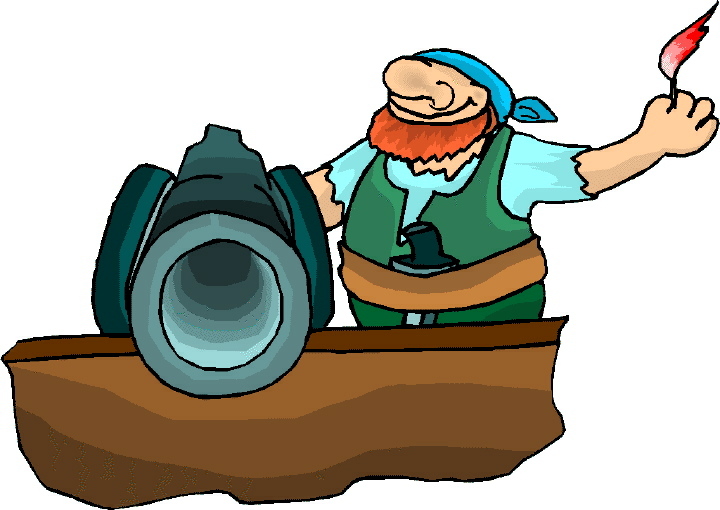 On November 21, 1718, Lieutenant Maynard and fifty-eight men battled Blackbeard and twenty other pirates on the deck of Maynard’s sloop. He shot Blackbeard, but Blackbeard broke Maynard’s sword. A Highlander saved Maynard’s life by slaying Blackbeard before he delivered the fatal blow. 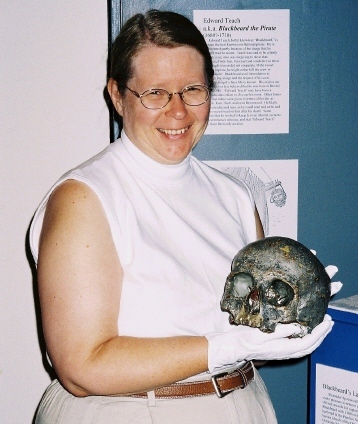 On his return to Williamsburg, Maynard hung Blackbeard’s decapitated head from the bowsprit of his ship. He dumped the body overboard. Today it is difficult to separate myth from reality where Blackbeard is concerned. Some stories say he had fourteen wives, some of whom he shared with others. He’s known by several names - including Drummond, Thatch, and Tash - but Edward Teach is considered his official name. Few details of his early life are known, but he may have been born in Bristol, England. For thirteen months he terrorized people along the coast of North America and in the Caribbean. In the late 1990s archaeologists discovered an underwater wreck they believe is the QAR. Their excavations are on going. In November 1720, Calico Jack Rackham and his crew stood in the dock of the Admiralty Court on Jamaica. What made the trial sensational? Two of the accused were women. Although history records instances of female pirates, Anne Bonny and Mary Read are the best known. Rackham arrived in New Providence two years before his capture and served as quartermaster aboard Charles Vane’s pirate ship. The crew quarreled with Vane and elected a new captain - Jack Rackham – then they put Vane ashore. In 1719, Woodes Rogers granted Rackham a pardon. Soon afterward he met Anne Bonny, the illegitimate daughter of an Irish lawyer who lived in South Carolina. Anne had come to New Providence after marrying a destitute seaman named James Bonny and running away with him. 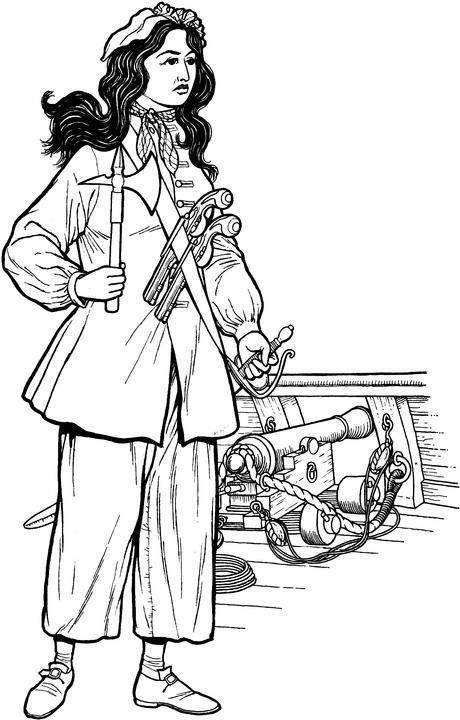 Eventually, she became Calico Jack’s mistress, disguised herself in men’s clothing, and joined his crew. One day they captured a ship and invited her crew to join their ranks. At least one did. Legend says Anne took a liking to this newest pirate, but when she approached him, the man revealed he was actually a woman named Mary Read. Raised as a boy, Mary joined the navy for a time before enlisting in the British army. During her service, she fell in love with another soldier, whom she married. They retired and opened a tavern. When her husband died, Mary returned to the sea. The entire crew was convicted and sentenced to hang, but Anne and Mary plead their bellies (meaning they were pregnant). Since English courts would not put an innocent babe to death, the women earned reprieves. The men were executed on November 27th. Mary died in prison five months later. Anne’s fate remains unknown. In spite of his gentlemanly ways, he tortured or murdered others when necessary to gain what he wanted. Speed and savagery characterized his attacks. Considered one of the most successful pirates who ever lived, he captured over four hundred ships. His adventures took him to Africa, the Caribbean, and Newfoundland. He died in 1722 when the HMS Swallow fired a broadside of grapeshot at close range into his ship. His crew threw Roberts’ body overboard so the English couldn’t capture and display it as an example to others. His men fought for three hours before they surrendered. Fifty-four were hanged while thirty-seven were sentenced to prison or transportation to the colonies. Those who remained were acquitted, except for seventy Africans. They were sold into slavery. Stede Bonnet was an educated plantation owner on Barbados. His reasons for becoming a pirate are unknown, but he purchased rather than “acquired” his ten-gun pirate ship, the Revenge, and hired a crew of seventy pirates. They set sail in the spring of 1717 and plundered ships sailing near Long Island, Virginia, and South Carolina. On learning Britain again warred with Spain, he sought a pardon from the governor of North Carolina and became a privateer. In time, though, he resumed his pirating ways. To escape detection he renamed his ship the Royal James and assumed an alias, Captain Thomas. He captured nine prizes, then put in at Cape Fear to make repairs. While there, Colonel William Rhett and his men attacked the pirates, who battled for five hours before surrendering. Bonnet managed to escape, but was soon recaptured. Most of his crew were hanged in November 1718 on White Point near Charleston. He danced the hempen jig on 10 December 1718. Konstam, Angus. History of Pirates. Lyons Press, 1999.